In this Seoul Travel Guide for Food Lovers I’m going to share with you practical information about where to stay, how to get around, and most importantly, what to eat when you’re in Seoul. There are a lot of amazing things about Seoul, but for you and I as food lovers, it’s the never ending amount of delicious food that makes Seoul such an exciting city. Seoul Travel Guide for Food Lovers! 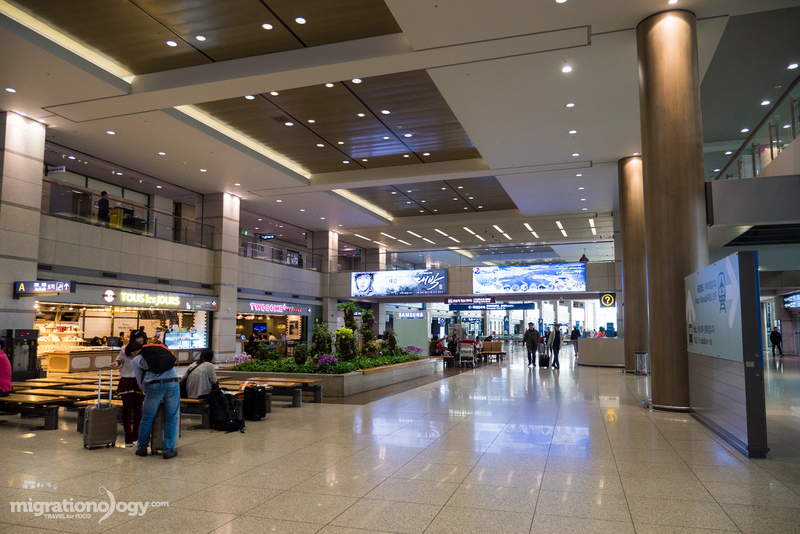 There are a number of ways you could enter Seoul, but likely, if you take an international flight from a different country, you’ll land at Incheon International Airport. Incheon International Airport is a giant airport that caters to basically the entire northern part of South Korea, and is located approximately 1 hour by train from the center of Seoul. The airport is very nice and modern with easy transportation facilities (and there’s free wifi as well). I’ve even spent the night at Seoul Incheon Airport before, and it’s a pretty decent place to spend the night if you need to. Express Train – This is the faster high speed train that goes directly from Incheon Airport to Seoul Station, and if you want to make sure you have a seat or if you have a lot of baggage this might be the best option. It takes about 43 minutes and the price is 14,800 Won ($12.62) per person. Seoul Metro – I’ve never taken the express train, because the metro goes the same route, only take a few minutes longer and costs much less. But it does stop at 11 different stations along the way, and it can be busy, so you may need to stand. It takes about 56 minutes and costs 3,250 Won ($2.77). You can read more information here, also scroll below to the Transportation section of this guide for more information about buying subway tickets and getting around Seoul. Another wonderful thing about visiting South Korea is that for many nationalities, getting a 90 day or 30 day stamp on arrival is a breeze. However, make sure you do your own research for your own nationality. If you qualify, all you have to do is fill out the small entry card (which you’ll be given on your flight), fly into Incheon International Airport, go through immigration, and they’ll stamp you into South Korea. Alright, now you’re in Seoul! If you’re traveling onwards from Seoul to other parts of South Korea, taking the train is one of the most convenient ways to get around. Many trains to other parts of South Korea leave from either Seoul Station, Yongsan Station, or Cheongnyangni Station. It’s recommended to book your train tickets a few days ahead of time so you can confirm that you’ll have a seat. From Seoul my wife and I traveled to the food paradise of Jeonju, and we pre-booked out ticket the day before we left. Here’s some information to help you choose where you stay. Seoul is a huge city and there are many different areas to stay in depending on your interests. However, what I noticed about places to stay in Seoul, is because the public transportation system is so efficient and convenient to use, it’s not hugely important which area you stay in (as long as you’re somewhat central), because you can always get to where you need to go. 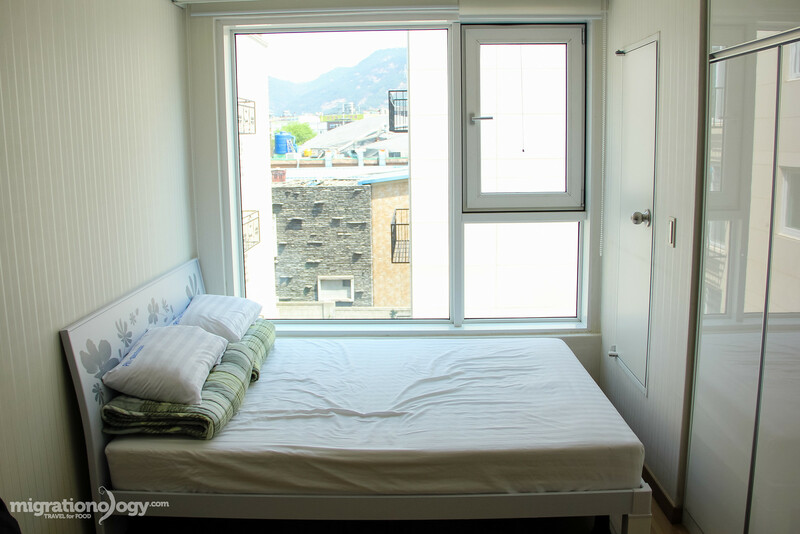 Seoul has nearly every form of accommodation available from modern hostels to major 5 star hotel brands. Prices for accommodation are overall quite high, but you do have plenty of options. Jung-Gu and Jongno-Gu – These two districts are what I would call the most central to Seoul sightseeing and shopping and right in the heart of the downtown area of Seoul. You’ll find many hotels in this area and it’s a great area to stay if you want easy access to the famous attractions without spending much time on the metro. Myeongdong – Myeondong is one of the biggest shopping districts in Seoul, and it’s home to lots of restaurants, hotels and trendy fashion and nightlife. Stay in Myeongdong to be surrounded by shopping. Seoul Station (Yongsan-Gu) – The area around Seoul Station is huge, and you’ll find both high end and lower end hotels. There’s not so much to do or see right at Seoul Station (although it’s very close to Namdaemun market and Myeondong), but it’s convenient for transportation. Hongdae (Hongik University) – Hongdae is located in Western Seoul and it’s known especially for being a university town and therefore there’s plenty of shopping, restaurants, street food, and nightlife. It’s overall a great local area of Seoul and a fun area to walk around and explore. There are lots of guest houses in this area, so it’s a good place to looks for budget to mid-range accommodation. Gangnam-Gu – Finally, there’s Gangnam, which is an area of Seoul that is known for being high end and very trendy. There are some very fancy and upscale hotels in this area. Airbnb Rental (<- use that link for a $25 discount) – I’ve stayed at a number of hotels in Seoul, but on my latest trip, when my wife and I were writing this Seoul travel guide, we stayed at a rental apartment near Seoul Station. I think an apartment rental works quite well in Seoul, especially if you’re traveling with a group of friends or family so you can all be together and get a pretty decent deal. Phil House – I also stayed at Phil House, a small and friendly hotel that’s clean and modern. The only problem is that it’s located a little far from central Seoul (but close to the Subway station), but it’s usually a pretty good price. *NOTE: The link to hotels above are affiliate links, meaning that if you make a booking I will get a small commission at NO extra expense to you. 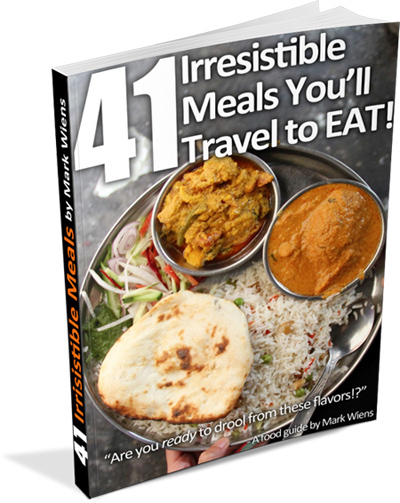 Your support will help me continue making free travel guides like this. Thank you! 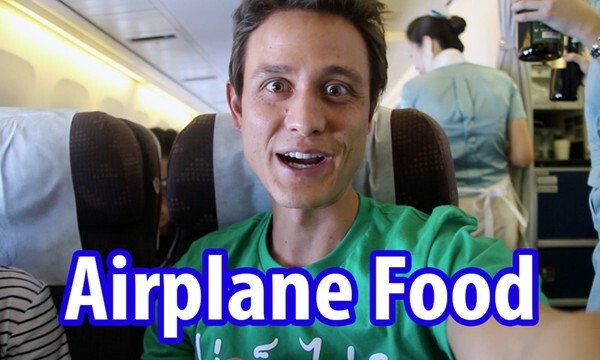 Seoul travel and food guide – eating Korean bbq! I’m a huge fan of Korean food and especially the Korean feasts where a mind-blowing array of main and side dishes are placed on the table before you. I’ve listed a few of my absolute favorite Korean foods I’ve tried so far, and dishes that you can find across Seoul and South Korea. This is not an extensive list, just a samplers platter of a few of my personal favorites. Banchan (side dishes) – Let’s begin with banchan, which is the name used to describe the multitude of Korean side dishes that can include all sorts of mini plates of pickles, chili marinated bits, fritters, and even sometimes little bites of leftovers. While a main dish might be the heart of Korean food, the banchan side dishes are the body, they make a meal function and make a meal complete. Kimchi is one of the most common banchan. Gamjatang (pork bone potato stew) – This soup is made with pork spine bones and potatoes which are boiled until the meat left is fall apart tender. You can usually order the kimchi version, which is absolutely sensational. Of all the food mentioned in this Seoul travel guide blog, this is one of my absolute favorite dishes. Gogigui (all things grilled meat) – One of the ultimate Korean meals are pieces of meat, grilled on your table before you with all the side dishes and dipping sauces. Korean barbecue is incredibly delicious. Sundubu Jjigae (kimchi stew) – Mainly made with un-curdled tofu and lots of red chili flakes, sundubu jjiggae is both spicy and richly flavorful. The tofu is so good it almost tastes likes scrambled eggs. 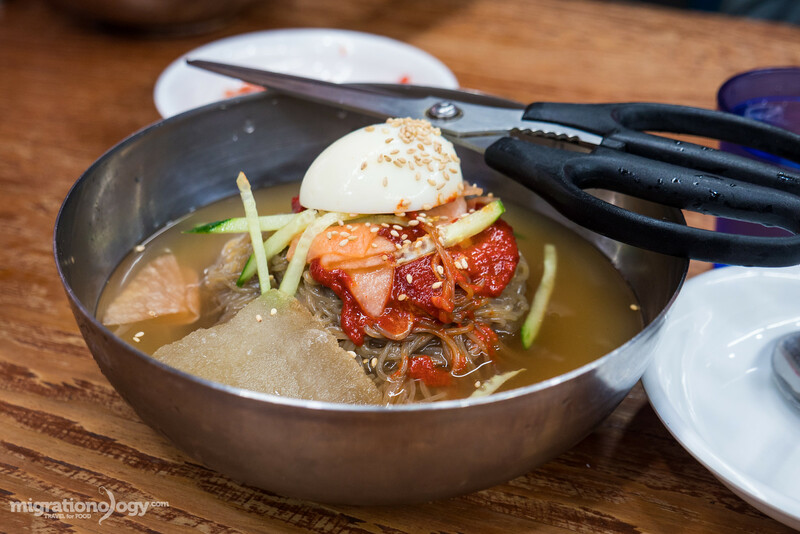 Naengmyeon (type of noodles) – Of all the Korean noodle dishes, naengmyeon which is a type of buckwheat noodle with some other starches mixed in and served icy cold, is one of my personal favorites. The chewy texture and surprising icy-ness makes this dish fantastic. Samgyetang (ginseng chicken soup) – Known to be a health dish, but also really delicious, samgyetang is a Korean spring chicken ginseng soup. A whole young chicken is typically stuffed with rice and garlic, and boiled with ginseng and jujube. Godeungeo-gui (grilled fish) – Any chance that I can get to eat fish, I take it, as fish is one of my personal favorite things to eat. In Seoul you’ll find a dish called godeungeo-gui, which is grilled salted mackerel. The fish is usually nice and oily (full of delicious oils), and goes great with rice and kimchi. Mandu (dumplings) – Many cultures around the world have some kind of dumpling, and in Korea, mandu are meat and vegetable filled dumpling pockets. They can either be steamed or deep fried, and they are delicious either way. Hanjeongsik (full set meal) – Hanjeongsik, a Korean full set meal, is one of the ultimate Korean meal experiences. An array of food that will literally cover every square centimeter of your table is placed before you, including a mix of main and side dishes. It’s a dream come true for food lovers. Patbingsu (shaved ice dessert) – This last Korean food on the list is a dessert that is not my personal favorite, but it’s one of my wife’s favorites. The literal translation is red beans and ice, but they have become somewhat of a national and international Korean shaved ice phenomena full of bright and colorful toppings. Here are some of the famous places to eat patbingsu in Seoul. Also, be sure to check out my more extensive list of top Korean food here. When it comes to Korean street food in Seoul, there are both traditional snacks and also many modern trendy street foods. I’m personally a huge fan of more of the traditional Korean street food dishes (ex. rice rolls, blood sausage), but not so much of a fan of the modern trendy things you’ll find on the streets and at shopping markets (ex. hot dogs, sweets). 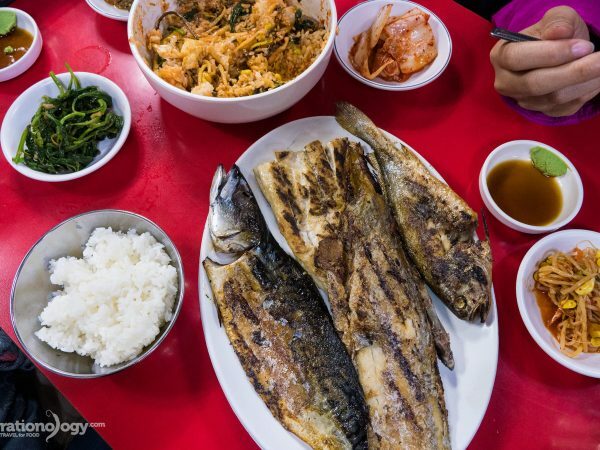 Here’s a mix of some of the most common street foods you should try when you’re in Seoul. Tteokbokki (rice cake rolls in chili sauce) – This is probably the most common Korean street food snack, which includes bite sized rice cakes braised in a tangy chili based sauce. You’ll find tteokbokki at countless street food stalls throughout Seoul, and it’s especially common for young people. 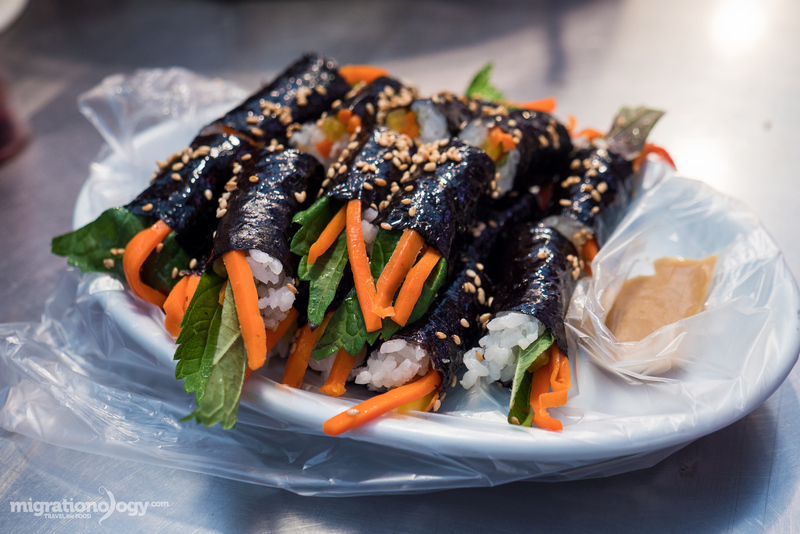 Gimbap (seaweed rice rolls) – This is one of the greatest Korean street food snacks in my opinion, Korean rice and seaweed rolls. The rolls can be filled with a combination of mostly vegetables, and what I really love about them is the common use of sesame seeds and sesame oil to give them a wonderful taste and aroma. 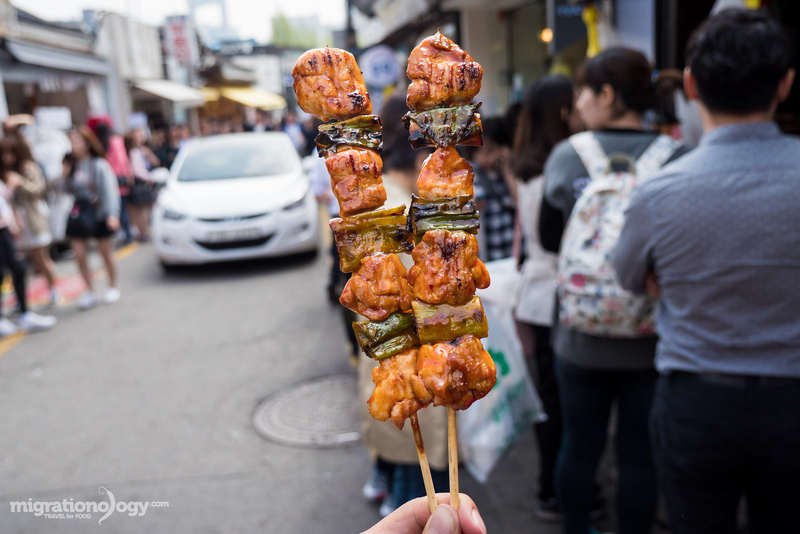 Dakkochi (grilled chicken skewers) – Another one of my favorite street foods featured in this Seoul travel guide are dakkochi, skewers of chicken and leek, grilled to perfection and either seasoned with salt or with red chili paste. Twigim (deep fried nuggets) – Twigim can refer to a variety of bite sizes fritters, which are battered and deep fried. They are often compared as Korean tempura. Odeng (oden) – Similar to Japanese oden, but called odeng in Korea, it consists of various fishcakes and vegetables on skewer boiled in dashi broth. Hotteok (stuffed pancake) – Hotteok is a stuffed pancake that can either be sweet or savory. I’m partial to the salty version, sometimes filled with sweet potato noodles and bulgogi. They are oily and delicious. Gamja dog (deluxe hot dog) – Yes, I had to end with the gamja dog, the creation that is a hot dog on a stick, covered in French fries. 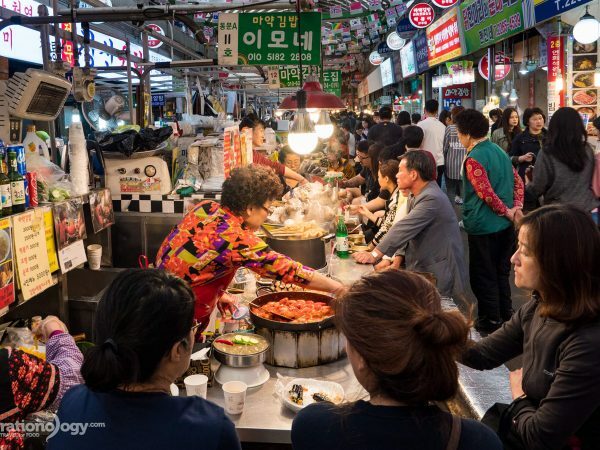 Dongdaemun Food Street – There’s a street with a bunch of Korean food stalls during the day, located at Dongdaemun Market. When you’re walking around Seoul and if you see other street food snacks like steamed silk worms, water chestnuts, or fruit, be sure to give them a try! Are you enjoying the photos in this guide? Check out the camera I use here. There are not only thousands of restaurants in Seoul, but there are literally thousands of really good restaurants in Seoul. So in this Seoul travel guide, I’m writing from my personal experience about restaurants and dishes that I enjoyed. However, I haven’t even come close to eating at a measurable percentage of all the restaurants in Seoul. The point I want to make is: Don’t limit yourself to just the restaurants I’ve mentioned below, but do some research in the area you’re staying in and you’ll likely find similar restaurants. Jaedong Sundubu – This place serves a seriously amazing bowl of sundubu jjiggae (soft tofu stew). Address: Bukchon-ro 2-gil, Jongno-gu, Seoul, South Korea; How to get there: Take the subway to Anguk station and Exit #2. Bukchon Son Mandu – This famous restaurant in Seoul serves mandu dumplings, both steamed and fried, and an awesome bowl of naengmyeon, cold buckwheat noodles. Address: Branches in Insadong and within the Bukchon Hanok Village (original branch); Open hours: 11 am – 10 pm daily; Prices: About 5,000 – 10,000 Won ($4.27 – $8.53) per person. 예송숯불갈비 (for grilled meat, sorry not sure of the English name) – This is just a local typical neighborhood grilled meat restaurant near Seoul Station that serves both pork and beef. I liked it because it was friendly and no-frills, just good food and a nice atmosphere. Address: ; Open hours: 10:30 am – 11:30 pm daily; Another good option for grilled meat in Seoul is New Village Restaurant. Hanchu (한추 fried chicken and beer) – I got this restaurant recommendation from my friends Dan and Jeffrey of Foodiehub. Hanchu does crazy good fried chicken, and their trick is they add some pounded fresh chili to the batter. Address: 549-9 Sinsa-dong, Gangnam-gu, Seoul; Open hours: 5 pm – 3 am daily; Prices: One whole fried chicken is 17,000 Won ($14.50). Jinjujip (진주집) – Oxtail soup (kkori gomtang) is a dish that Koreans do very well, and while I enjoyed, it seemed to be overpriced. But never the less, it was pretty good. This place is located within the back alley of Namdaemun Market. Open hours: I’m not fully sure, but I think it’s mainly a lunch restaurant; How to get there: Namdaemun Market, take the metro to Hoehyeon Station, Exit 5; Price – 21,000 Won ($17.62) for the oxtail soup, which was very pricey. 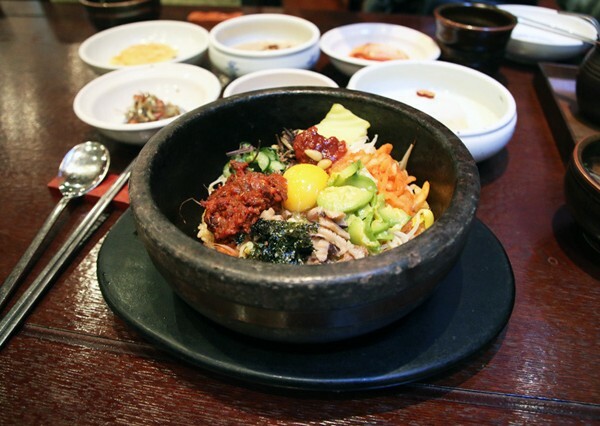 Gogung (고궁 – 인사동점) Bibimbap – Bibimbap is a famous Korean dish of rice and toppings all mixed together. When you’re in Insadong (there’s also a branch in Myeong-dong), this is a great place to try bibimbap. Address: 38 Gwanhun-dong, Jongno-gu, Seoul 110-300, South Korea; Open hours: 11 am – 9:30 pm daily; How to get there: Take the metro to Anguk Station, Exit 6. 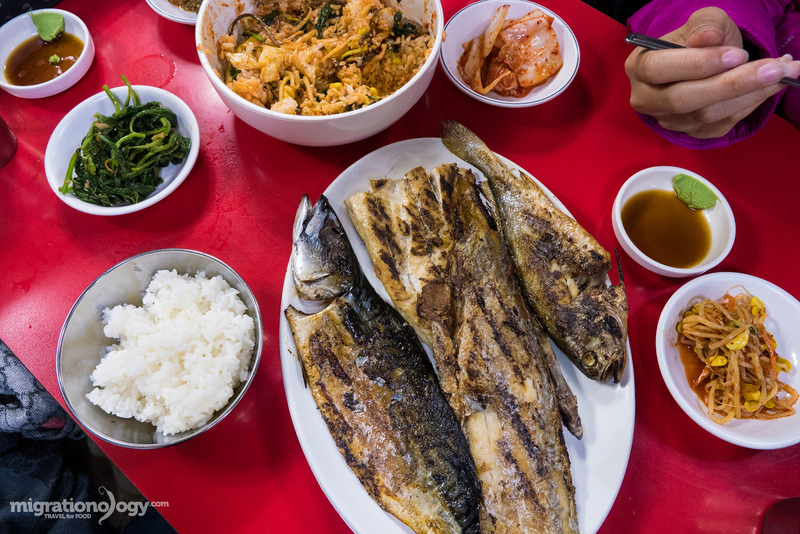 Dongdaemun Grilled Fish Street – Located near the Dongdaemun Market in the Pyeonghwa Market, there’s a street, more like a walking alley, that’s filled with grilled fish restaurants. They all looked pretty similar, and they all remain quite local. The fish was salty and grilled to perfection. How to get there: Take the metro to Dongdaemun Station, Exit 9, walk up the street to the market, and then cut into the alley. 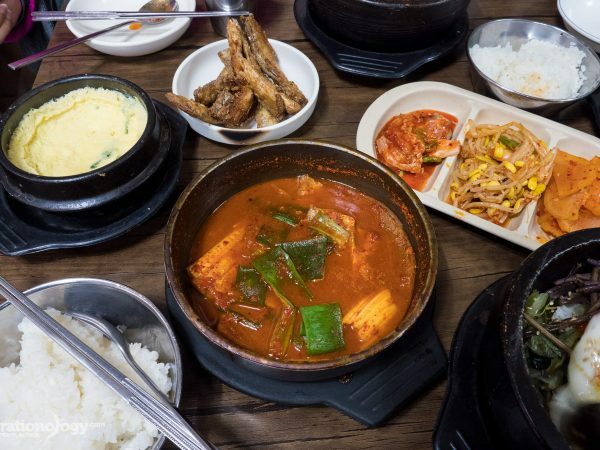 Namdaemun Hairtail Alley – Similar to the grilled fish alley, but this time within Namdaemun Market, there’s a hairtail fish alley where you’ll find a number of restaurants serving a spicy hairtail (cutlassfish) chili stew. I had it for the first time on this trip to Seoul, and it’s now one of my favorite Korean dishes. Open hours: throughout lunch and early evening, probably best to go at lunch, and some restaurants are closed on Sunday; How to get there: To get to Namdaemun market, take the metro to Hoehyeon Station, Exit 5. Gamjatang near Seoul Station – On this trip to Seoul, this was my first meal, as soon as my wife and I got to Seoul Station we were hungry. Just outside the station, across the street from Exit 15 is a nice neighborhood restaurant to eat gamjatang. How to get there: Seoul Station to Exit 15, cross the street and walk to your right hand side. 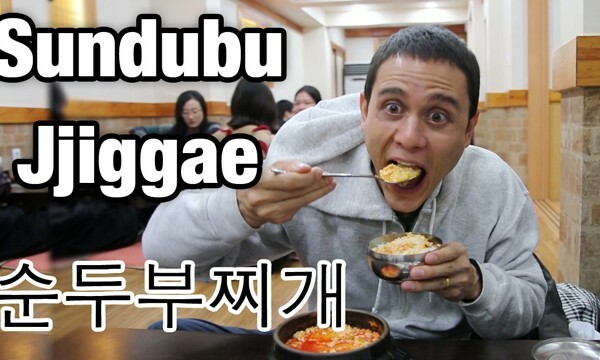 Here are some of the latest articles about food and travel in South Korea that I’ve published. Here are a few of the top things to do when you’re in Seoul, when you’re in-between meals of course. Also, be sure to check out my more complete list of 25 things to do in Seoul. Gwangjang Market – This old market is one of the greatest culinary destinations in all of Seoul, and if you love food, there’s absolutely no way you’re going to want to miss a chance to eat here. 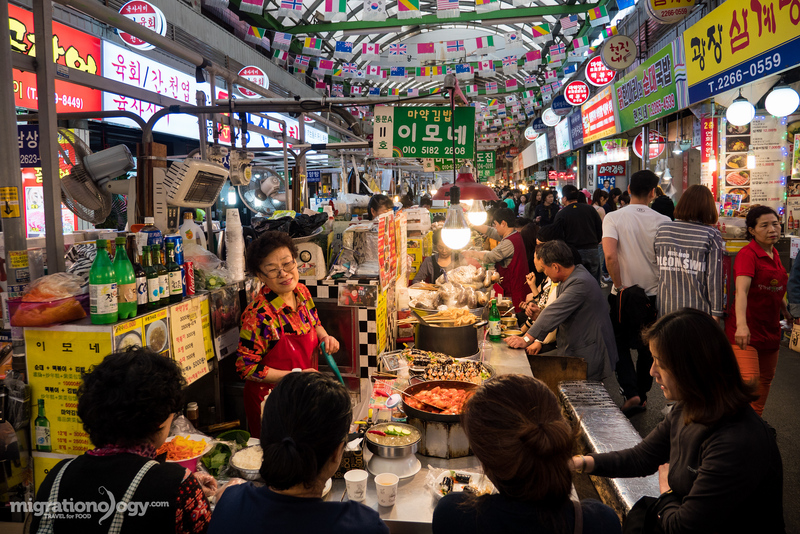 The market is set up with dozens of street food vendors that sell both snacks and full meals and you’ll find dishes like tteokbokki, gimbap, soondae, mung bean pancakes, and all sorts of fresh seafood. Gwangjang Market is the ultimate Seoul food destination. Even though it’s been written about in nearly all Seoul travel guides, it remains very local. Open hours: 9 am – 6 pm daily; How to get there: Take the subway to Jongno 5-Ga, Exit 8 or 9. Noryangjin Fish Market – Another interesting place to go when you’re in Seoul is the Noryangjin Fisheries wholesale market, one of the biggest fresh seafood markets in Seoul. The amount and diversity of fresh seafood available is remarkable. You can walk around and just admire all the seafood creatures, and there are also restaurants within the market where you can buy seafood and have a restaurant cook it for you. Additionally they have freshly sliced raw fish (which is called hwareo hoe, like sashimi) that you can buy. Open hours: 24 hours, but anytime in the day is good; How to get there: Take the subway to Noryangjin station, Exit 7. Gyeongbokgung Palace – The Gyeongbokgung Palace is probably the number attraction in Seoul according to most Seoul travel guide books, and it is worth a visit when you are there. 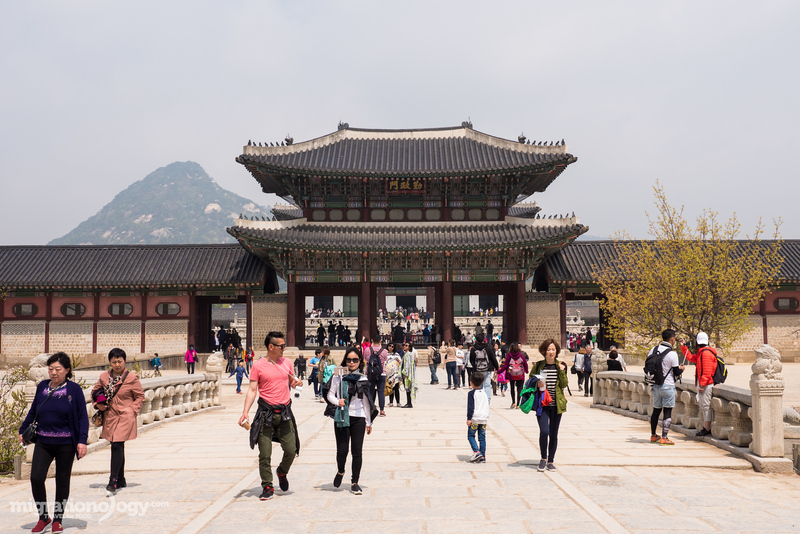 Built in the Joseon dynasty in the 1300’s, it’s a huge complex of gates, walls, courtyards, and palaces. It’s such a huge area that it’s almost like a park, with ponds, bridges, and gardens. Open hours: 9 am – 6 pm from Wednesday – Monday, closed on Tuesday; Entrance price: 3,000 Won ($2.56); How to get there: Take the subway to Gyeongbokgung station Exit 5. Bukchon Hanok Village – A hanok is the word for traditional Korean homes, and Bukchon Hanok is one of the best preserved traditional villages in Seoul. The village, although it’s still real and people still live there, has become a very popular tourist attraction for both foreigners and local Koreans. I think it’s a pretty nice area to just walk around leisurely, eat some food, and just enjoy the scenery. Open hours: business hours throughout the day and evening; How to get there: Take the metro to Anguk Station, Exit 2. Changdeokgung Palace – Changdeokgung Palace was one of the main palaces during the Joseon Dynasty, and it remains one of the best preserved and most beautiful places in Seoul. The catch is that you have to join a tour to see it, so you’re not as free to walk around on your own terms. Open hours: 9 am – 6 pm from Tuesday – Sunday, closed on Mondays; Entrance price: 300 Won ($0.26) for entry into the palace ground, 3,000 Won($2.56) for entry and tour of the secret garden; How to get there: Take the subway to Anguk station, Exit 3. Myeongdong Shopping – It seems that a lot of people come to Seoul for the shopping, and one of the most popular shopping destinations is the Myeongdong walking street (or entire neighborhood). You’ll mostly find clothes and cosmetics, but there are also some street shops and plenty of street food available especially in the afternoon and night. 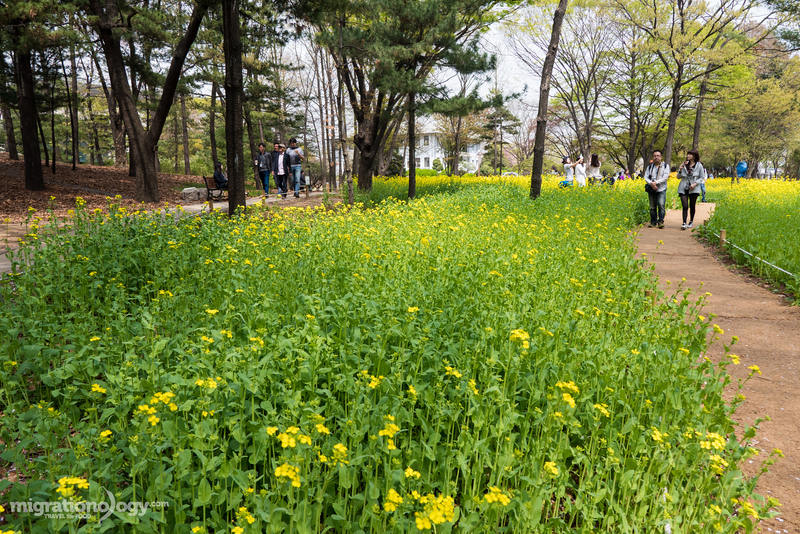 Cheonggyecheon Stream – Walking and exercising in parks goes great with being a food traveler. I’m a huge fan of eating and then taking a stroll around the city without doing really anything but just walking and people watching. The Cheonggyecheon Stream is a 5.8 km long stream and walkway that runs adjacent to a busy road that goes right through the center of Seoul. It was formerly just a waterway, but the city breathed new life into it by cleaning it up and making it a public recreational park. Namdaemun Market – This is another place I really enjoy in Seoul, and I included it in this Seoul travel guide not so much for the street shopping, but because it’s a great place to eat. There are some wonderful food alleys within the market, and also some great street food. Namdaemun Market is busy and hectic and a great environment. Open hours: Business daytime hours; How to get there: It’s easiest to get there from Hoehyeon Station and follow the clearly marked signs for Namdaemun Market. This wraps up a few of my favorite things to do in Seoul. But in reality, I think the best thing to do is just walk around and explore the food! 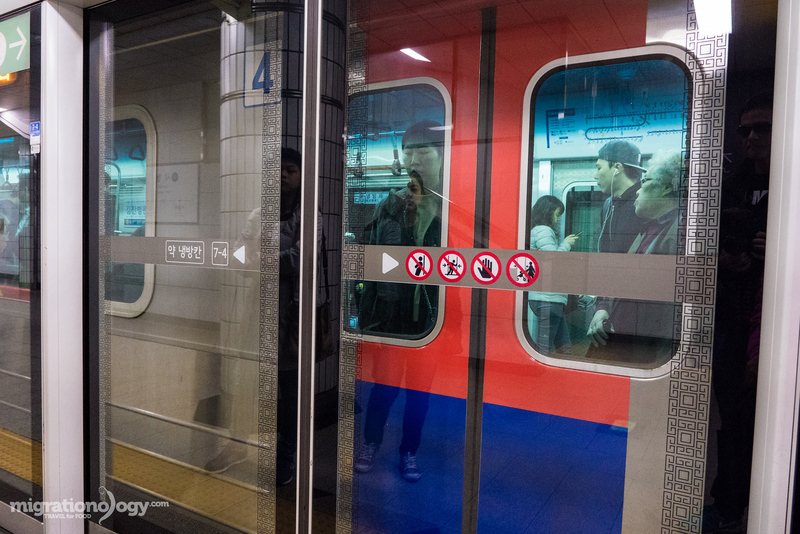 Seoul not only has one of Asia’s best and most extensive public metro transportation systems, but it’s one of the best city subway systems in the world. There’s almost nowhere you can’t get to, even off the beaten path places, by taking the Seoul Metro, and walking a little ways. The T-money card is the all access pre-paid money card for transportation in Seoul, and buying one makes getting around much easier and quicker. You can buy a T-money cards at most convenience stores like 7-Eleven or CU and you can re-load money at all subway stations. The T-money card can cost 2,500 – 4,000 Won ($2.13 – $3.41) depending on where you buy it, and then you can add as much money at a time as you like. When you’re done with your T-money card, you can get a refund at convenience stores but they will take a 500 Won processing fee. 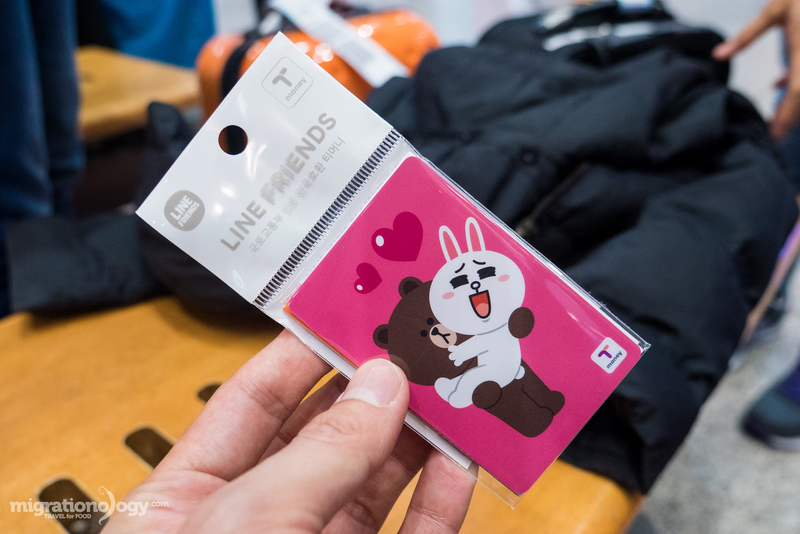 Even if you’re just staying in Seoul for a few days, a T-money card is well worth purchasing. Seoul Metro – When you look at the Seoul Metro map, it looks pretty intense. And it is. But the good news is, it’s actually very easy to figure out and to use. Stations are well marked, and they’ve done a great job at managing crowds and stations. Just take your time, figure out your destination and the exit you want to take, and you can get almost anywhere in central Seoul using the metro. To pay, you can either buy a single ticket at the self service machine, or if you have a T-money card (which I’d recommend) you can add however much money onto your card and just swipe it to ride. Open hours: 5:30 am – 12 am midnight daily; Prices: 1,250 Won for a normal ride (with T-money card) or 1,350 Won without a T-money card, and then rates go up depending on distance. Buses – Additionally, Seoul has an extensive bus network that you can use to get pretty much anywhere as well (if you know the route you need to take). You can use your T-money card to pay for bus rides as well. Here’s more information about riding the bus. Taxis – Finally, if you need to get somewhere quickly or if the Metro has already closed, taxis in Seoul are always available. Taxis in generally are pretty good, but make sure they use the meter and make sure you have a bit of an idea where you’re going. You can even use your T-money card to pay for taxis. Here are some good taxi tips. Prices: 3,000 Won ($2.56) is the base price and then goes up by distance. Public transportation in Seoul is excellent, extensive, and you can get about anywhere you need to go just with the Seoul metro. I would classify Seoul as a pretty expensive city to visit, similar to Tokyo or Singapore. And also, the cost of living in Seoul is very high. Accommodation will likely be your biggest expense when traveling to Seoul, and unless you have a friend you can stay with, there’s no great way around expensive accommodation (even hostels are pricey). That being said, you can find budget food and both attractions and transportation are pretty affordable. This is not an exact guide, but just meant to give you an idea of the kind of prices you can expect to pay when you visit Seoul. These are known as “Narcotic Rice Rolls,” because they are so addictive. I’ve traveled to Seoul a number of times, but the series of videos below is from my most recent trip, where my wife Ying and I spent 6 days in Seoul and then traveled onwards to Jeonju (another amazing Korean food destination by the way). Seoul is a huge and modern city in South Korea, home to never ending shopping, historical attractions, a thriving art and design scene, and an abundance of delicious food that will keep you occupied for as long as you stay. 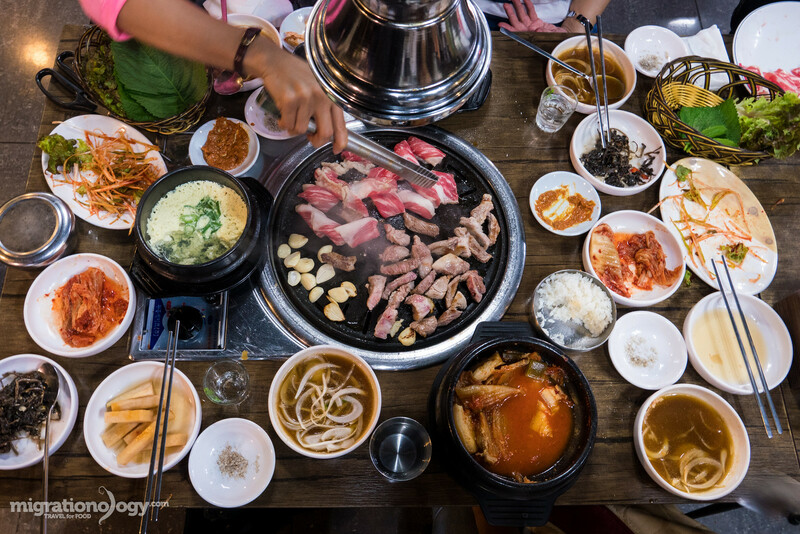 In this Seoul Travel Guide for Food Lovers we’ve covered information and tips on where to stay, how to get around, and Korean food and restaurants. I hope this guide will give you some great ideas for your trip so that you can make the most of your time in Seoul and eat some seriously amazing food! Have you been to Seoul? Any extra tips? I’d love to hear from you now in the comments section below. Leave a comment! Was this Seoul travel guide helpful for you? Book your accommodation using this link (it’s an affiliate link to Booking.com, and at NO extra cost to you, I will get a small commission). Make a Donation – Thank you! Share This Guide – If you have a friend that would benefit from this guide, send them an e-mail and share it with them. Or post this guide on Facebook or Twitter. Your contribution will go directly into making more free guides and videos like this. Thank you in advance!